Facts about mussels- Mussels are a good substitute for clams or oysters in a recipe. Mussel juice is delicious and can be drunk hot; it’s particularly tasty when mixed with a little melted butter, and can also be consumed chilled with tomato juice. While wild mussels need quite thorough cleaning, cultivated mussels need only be rinsed in cold water. Mussels are delicious when pan-fried, too. To pan-fry, heat the pan, melt some butter then add the mussel meat and sauté until brown – two to three minutes. 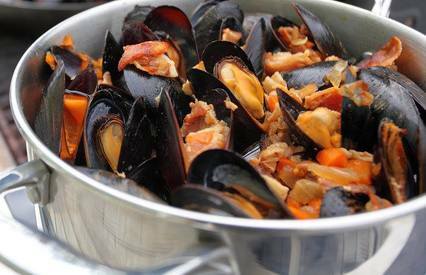 But the best recipe is Mussels with Bacon and beer broth - they are out of this world!! !